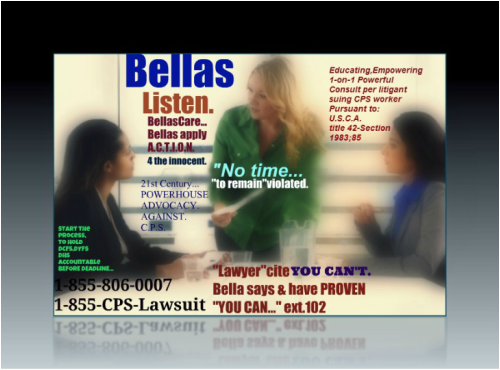 "More & more individuals are learning,thanks to Bellas on how to sue cps properly,known as Pro-se & Timely before deadline." U.S.Supreme Court,has said it best in multiple case law,when it come to the fundamental right(s)of such families,who are entitle to such privacy, freedoms familial association,without the infringement of one's right,by DCF,DYFS,ACS,DSS.1-855-602-5557 ext. (102) File suit against CPS when violated.Take back such right,when doing so.Deadline shall bar you soon enough,when your "waiting around" to file your U.S.C.Title 42-Section 1983;85,damages suit.Be sure to press button below to be taken to our HELP PAGE,to begin your suit,same-day,no delay." HELP PAGE TO SUE CPS TODAY. CHILD PROTECTION SERVICES ALLOW CHILD TO BECOME HARMED WHILE LIVING UNDER STATE SUPERVISION? YOUR BEING INFORMED,HOW YOUR CHILD IS JUST FINE,NO HARM HAS ARISE,INVOLVING YOUR CHILD IN FOSTER CARE? CLICK TO FILE SUIT,PRO-SE BEFORE DEADLINE BAR YOU FROM EVER SEEKING DAMAGES. THE TRUTH,CONCERNING YOUR ONCE HAPPY CHILD,NOW SUICIDAL WHILE IN FOSTER CARE,UNDER STATE SUPERVISION? CLICK TO BEGIN YOUR LAWSUIT PRO-SE BEFORE TIME RUN OUT TO SUE. CHILD WAS LOST IN THE SYSTEM,FOR A DAY,TWO DAYS,WEEKS,MONTHS? YET YOUR IN COURT,AND TOLD HOW YOUR CHILD IS DOING WELL,No Risk? CLICK HERE TO BEGIN,if your filing your lawsuit,pro se.
" CPS social workers,caseworkers,supervisory staff;managerial,shall be held accountable once per lawsuit is filed against such abhorrent worker who decided,she or he was going to hinder such information,concealment,engage in fraud upon the court;on the court,and feign child is doing well,but knew the whole entire time,the child condition"after such unwarranted removal"was deteriorating day in,day out. ext. 102. Such cases involving a conspire act to violate your constitutional right,after such falsity,has been lodged against you,allow yourself to begin on your lawsuit. Just because lawyers,as seen from state to state,widely known,is not going to sue for you,do not mean,your to "sit online and bemoan,about the issues. Fight Back against CPS,and commence such lawsuit,timely per prerequisite(notice of tort injury claim)prior to the issuance of summons,and complaint,to ensure your allowed to move forward with your lawsuit,when all notice(s)timely are filed; served,per worker whose clearly liable for the violation of your constitutional right.Such failed supervision of one's child when removed,entitle YOU, to sue for money damages, along with the children,being wrongfully kept from you,even when state already validated your complying with services,case plan,and or when the state has already cleared you,of such serious wrongdoing. acs, to Pennsylvania DHS,CYS,to California,Texas,to Montana,KY,to Idaho,Nebraska,IOWA,to Michigan,Ohio,Hawaii,to North,South Carolina DSS,to Oregon,and all states,per caseworker violation. Do not wait for another day,for another lawyer to turn you down,causing you AGAIN to be closer to deadline to file yourself timely,and properly.Call the pro-se expertise-team,unique prowess,involving such format,pro-se self file,to ensure your timely suing child protection services,and get started today,before your time run out to sue.Ask for heather marie rothstein,publicly recommended..
Ext.102 and take back your rights...your family...your life..."